Insect hatches on the River Suir are prolific, with good hatches of BWO, sedges, spurwings and many other olives. The hatches have declined in recent years as with most rivers, however during warm balmy evenings the river and its tributaries come alive with trout. The highlight of the angling season is the ‘Evening Rise‘ during the summer months from mid May until the end of August, From 7pm onwards, the river comes alive with spinner falls and hatches, for example in the earlier part of the evening the angler can encounter BWO duns, followed by some spinner action, and after that if conditions are right a hatch of sedge. 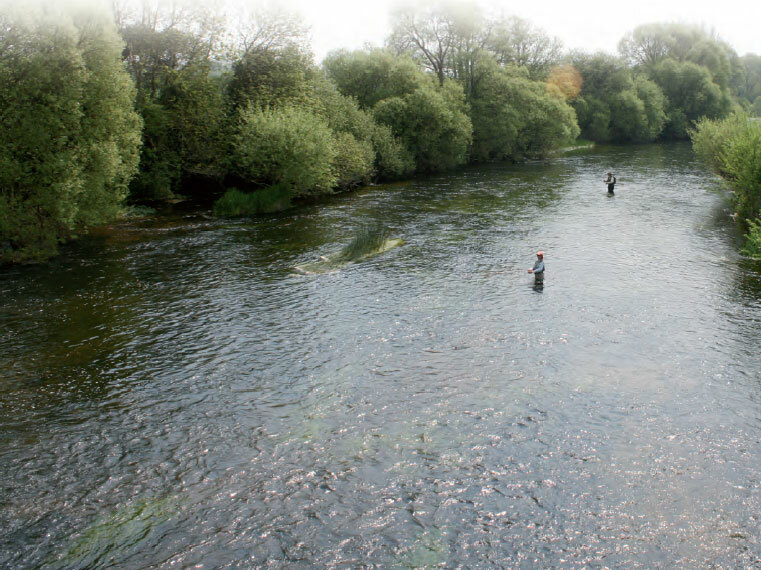 The Suir is a technical river to fish, with lots of slow pools and “slick” water with conflicting currents, making it hard to achieve a long drift. This adds to the mystery and beauty of the river, making the Suir a fascinating river to fish. Five flies which we’d recommend in an angler’s box on this river are pictured below. They are CDC Emergers, Comparduns, Pheasant Tail Heads, Klinkhammer and Elk Hair Caddis. Having these flies in various sizes would cover most fishing situations. Where possible, local knowledge should be sought as to the correct fly to use.